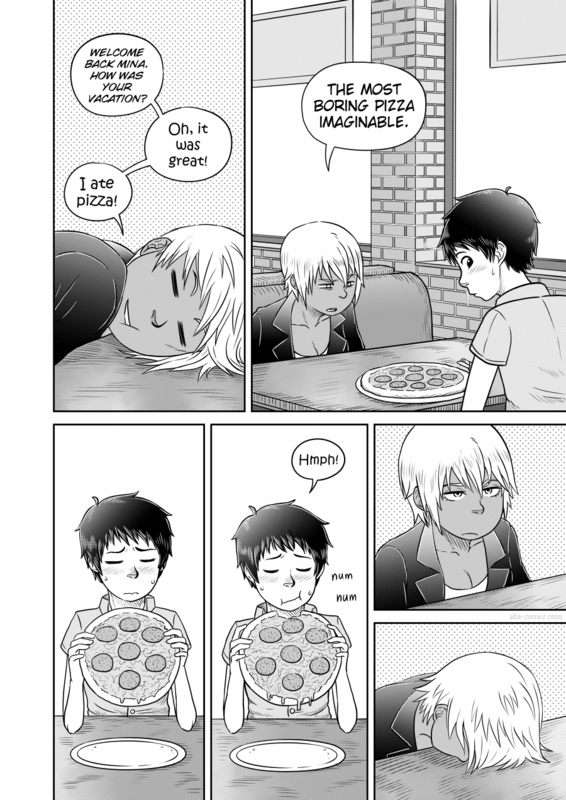 The first Patreon funded page is all about Mina awkwardly eating a pizza! Sorry for the lack of updates recently, I definitely need to work on getting better at that. Now, having more time is nice, but I also work really slowly. I think my process might be too involved? One of my new year’s resolutions was to set some time aside each week to get better at art. Studying anatomy, life drawing, getting critiques, stuff like that. I think improving my art in general will also help me draw more quickly, as I become more confident with my lines. I did want to post another piece of Awesomelab filler, but that image is hella NSFW, so I don’t know if I should post it here. Maybe I’ll put it on that Tumblr of mine I so rarely use. Oh and an update on my arm: It was doing fine for a while, but I totally fucked it up again by lifting some heavy objects around. So… there you go! You… You may have gone a bit too far on the dumbness here. At the rate Erin keeps banging her face on tables she’s going to end up with a flat head. Your art is very professional and your characters are very charming. I was happy to see another page in my RSS feed! Sorry to read about your arm. Hope you get better soon. Actually, the most boring pizza imaginable is plain cheese. Then again, I believe mutilating pizza in such a way is rather unique, so I suppose it could be quite interesting, depending on your interpretation. Plain cheese pizza is beyond Mina’s imagination. Mina would have told the whole story. But Erin ruins the moment. I like Alien Hand Syndrome. Please write more. 🙂 I want to know what happens next.